This detailed view shows the central parts of the nearby active galaxy NGC 1433. The dim blue background image, showing the central dust lanes of this galaxy, comes from the NASA/ESA Hubble Space Telescope. Image released Oct. 16, 2013. A powerful radio telescope in Chile has peered deeply into the universe and captured an incredible sight: an ancient black hole chowing down on a massive snack. 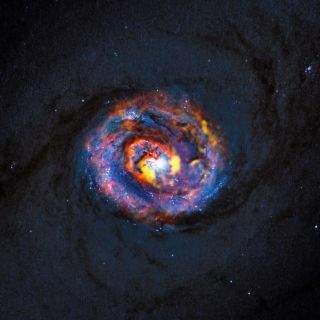 New photos released by the European Southern Observatory (ESO) show a distant active galaxy called PKS 1830-211 eating huge amounts of matter, boosting its super-energetic jets of material to extremely high levels. You can watch a video fly-through of the two new black hole discoveries provided by ESO. "The ALMA observation of this case of black hole indigestion has been completely serendipitous," Sebastien Muller, co-author of a study about PKS 1830-211, said in a statement. "We were observing PKS 1830-211 for another purpose, and then we spotted subtle changes of color and intensity among the images of the gravitational lens," Muller added. "A very careful look at this unexpected behavior led us to the conclusion that we were observing, just by a very lucky chance, right at the time when fresh new matter entered into the jet base of the black hole." This image from the NASA/ESA Hubble Space Telescope shows the distant active galaxy PKG 1830-211. It shows up as an unremarkable looking star-like object, hard to spot among the many much closer real stars in this picture. Recent ALMA observations show both components of this distant gravitational lens and are marked in red on this composite picture. Image released Oct. 16, 2013. The gravitational lens effect in this case was created when light from PKS 1830-211 passed by a massive galaxy, distorting the image for observers on Earth. The huge foreground object warped space, causing the light from PKS 1830-211 to take a twisted path toward our planet. The ALMA radio telescope, which consists of 66 antennas, is also responsible for a second recent black hole find. The powerful telescope gathered new data about a molecular gas cloud located around NGC 1433, a quiet galaxy relatively close to the Milky Way. It takes about 30 million years for light from NGC 1433 to reach Earth, ESO officials said. "ALMA has revealed a surprising spiral structure in the molecular gas close to the center of NGC 1433," Françoise Combes, the lead author of the molecular cloud study, said in a statement. "This explains how the material is flowing in to fuel the black hole. With the sharp new observations from ALMA, we have discovered a jet of material flowing away from the black hole, extending for only 150 light-years. This is the smallest such molecular outflow ever observed in an external galaxy." The new observations are only the beginning for ALMA's work with supermassive black holes. Combes and his team are starting to study other active galaxies, and more observations of PKS 1830-211 are planned in the future. This wide-field image shows the patch of sky around the distant active galaxy PKS 1830-211. This view was created from photographs forming part of the Digitized Sky Survey 2. Image released Oct. 16, 2013. "There is still a lot to be learned about how black holes can create these huge, energetic jets of matter and radiation," Ivan Martí-Vidal, lead author of the PKS 1830-211 study, said in a statement. "But the new results, obtained even before ALMA was completed, show that it is a uniquely powerful tool for probing these jets — and the discoveries are just beginning!" Both of the new studies are detailed in the Oct. 16 issue of the journal Astronomy & Astrophysics. The $1.3 billion ALMA telescope is managed jointly by ESO, the National Astronomical Observatory of Japan and the National Radio Astronomy Observatory. ALMA officially opened for scientific business in March, though it won't reach full sensitivity until the end of the year, when all 66 antennas are expected to be working together.